The Mars rover revealed evidence of vast water formations in images sent back from the mission recently. In the 28-month-long search for evidence of the building blocks of life, the $2.5 billion mission to Mars has already discovered multiple elements scientists believe contribute to a habitable environment on the red planet. Water and evidence of other key elements like carbon, hydrogen, phosphorus, oxygen, and nitrogen and have already been found along with sulphates and sulphides leading scientists to conclude that the necessary elements to support life existed on the planet. Though evidence supported the existence of these conditions, scientists imagined the environment was most likely only serendipitous for thousands of years. With the latest transmission of images and data from the mission, scientists now believe they have found evidence to support the hypothesis that a long cycle of these necessary factors may have been at play on the surface of the planet for far longer. The rover, dubbed Curiosity, has been combing Mars over the past two months in a particular area of the planet’s surface called Gale Crater. This is a 96 mile wide crater with a three-mile high mountain in the middle of it, an extrusion known as the Aeolis Mons, or Mount Sharp. To bring the scale into perspective with geological formations on Earth, this Martian lake is bigger than Salt Lake and the mountain rising out of it is higher than Mount Rainier. 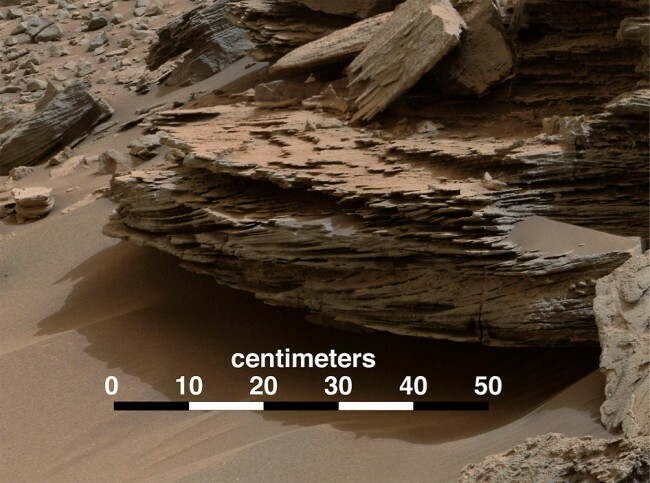 Evidence of vast water formations on Mars was revealed by the rover when Curiosity passed through the foothills of the now dry lake bed on its way to the center. Beginning in September, the rover found tilted beds of layered sandstone sloping downwards towards Mount Sharpe, encouraging geologists that these might be alluvial fans or streams which empty into bodies of water such as lakes. These geological formations are quite similar to ones witnessed on Earth where streams of water flow into a depression and deposit layers of sediment over long periods of time. Because the visible striations of sandstone and beds of silt are indicative of a long cyclical process and suggest fluctuations in the water supply and in the climate, it changes the available time frame for the perfect habitat for life from a few thousand years to potentially millions if not tens of millions of years. The information so far indicates that this cycle occurred at least a few times, perhaps many more. The process of erosion is thought to have left Mount Sharp in the center of Gale Crater on Mars. Since new evidence of these vast water formations was revealed, the Mars rover has begun slowly crawling up the side of Mount Sharp and collecting samples and data. It is merely 30 vertical feet up the mountain at the time of this writing, but in the coming months the rover will evaluate the lower levels of Mount Sharp to test the new scientific hypothesis, and will also test the chemistry of the rocks to see if the water which once comprised this lake bed was the kind that would support microbial life, if it ever did exist here.